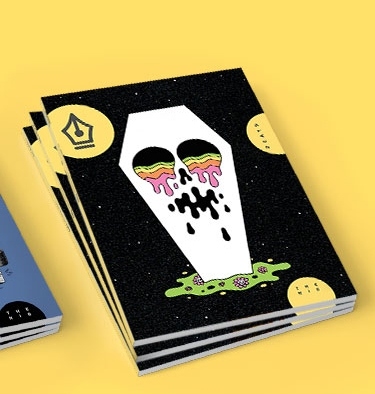 This first issue of The Nib‘s print magazine approaches death from many different perspectives—from Eleri Harris’ bright depictions of death figures to a sensitive exploration about the end of life by Theresa Brown, a hospice nurse. In “The Response” comic series, cartoonists responded to a question about what they want done with their bodies when they die; John Martz’s wish to be a pencil is delightful! The issue is full of heartache and humor. Turning from page to page, the reader encounters drug addiction, tender family moments, and a critique of lethal injection; it isn’t for the faint of heart…or perhaps it is. We have so much discomfort around a natural part of life. We do not want to talk about the social and political situations that lead to premature death for some or may allow for increased longevity for others. We will all be impacted by death and dying and need to develop better skills in navigating the socioemotional ocean around each death. So, should you spend a whole issue looking at themes of death? Research suggests that “when one confronts their own death in a specific and vivid manner, their feelings of gratitude tend to increase” (Frias, Watkins, Webber, & Froh, 2011, p. 161). Picking up this issue is one way to confront death and perhaps stimulate more gratitude and appreciation for the lives we are living. It is also full of beautiful art and thought-provoking content.